Combine the flour, sugar, and salt in the bowl of a food processor fitted with a metal blade. Pulse a few times just to combine the ingredients. Scatter the butter and hazelnut butter into the bowl and pulse just until the flour starts to form pea sized pieces. The mixture will be somewhat of a coarse meal. Combine the water, vinegar and ice in a small bowl and set aside. Turn the coarse flour out into a bowl or over a work surface and sprinkle over the ice water mixture a few tablespoons at a time. Use your hands to form the dough into one mass. Shape the dough into a disk, divide in half, wrap each piece in plastic, and refrigerate for at least 1 hour or up to 2 days. The dough can be frozen up to 1 month. In a medium saucepan, combine the sugar and water over medium-high heat until the sugar is dissolved. Add the butter and bring to a boil. Continue cooking until the caramel turns golden brown, whisking throughout and scraping the sides of the pot every so often, about 10 minutes. Remove the caramel from the heat, sprinkle in the salt, and slowly whisk in the cream. Thoroughly whisk together until smooth. Set aside to prepare the filling. In a large bowl, combine the apple slices, blackberries, lemon juice, and sugar. Toss to coat and set aside. On a lightly floured surface, roll out the first piece of dough into a 12-inch circle about 1/4-inch thick and place it into a 9-10-inch pie pan. Secure the dough to the walls while ensuring there’s an even overhang off the edges of the pan. Drain the apples and blackberries of any excess liquids. Sprinkle in the flour, cinnamon, black pepper, and salt to the fruit mixture and gently mix to incorporate. Place the fruit into the prepared pie shell, evenly pour over the caramel, and lightly toss to distribute. Roll out the second piece of dough into a 12-inch circle about 1/4-inch-thick. Take a pizza cutter or large knife and cut the dough into 1/2-inch-thick strips. 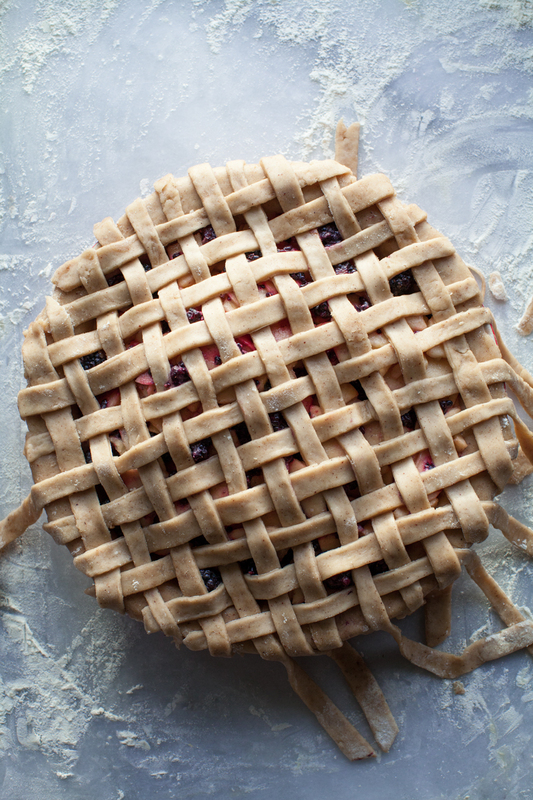 Assemble the lattice on top of the pie. Prepare the crust’s crimped edges by pinching both the excess bottom pastry as well as the overhang from the lattice strips into a crimped edge that sits along the rim of the pie plate. Chill the pie in the refrigerator for 15 minutes. Meanwhile, fix racks in the middle and bottom positions of the oven and preheat to 400. Brush the top of the pie with an egg wash to coat and sprinkle with coarse sugar. Place the pie on a baking sheet on the lowest rack in the oven and bake for 15-20 minutes until set and lightly browned. Lower the oven temperature to 350 and place the pie on the middle rack to continue baking for another 30-40 minutes until deep golden brown and the apple and blackberry juices are bubbling up around the edges. Let it cool slightly before serving. Serve with ice cream. The pie will keep refrigerated for 4 days or covered at room temperature for 3 days. It looks absoultley delicious. Where did you get those beautiful blackberry purple bowls and plate? Hi Beata, thank you! The bowl is made by Mud Australia. Bought online from Abc home, nyc. Um, this is absolutely gorgeous. The coloring on that crust, the flavor combination…I love it! Can’t wait to make this once blackberries are in season. This looks so tasty. I might try it with a crumble as my guy likes that more. That purple bowl is amazing too, reminds me of NYC in the fall. Thanks Stephanie, sounds like a nice idea for sure. mine loves crumble too. Beautiful pie and beautiful pictures! !